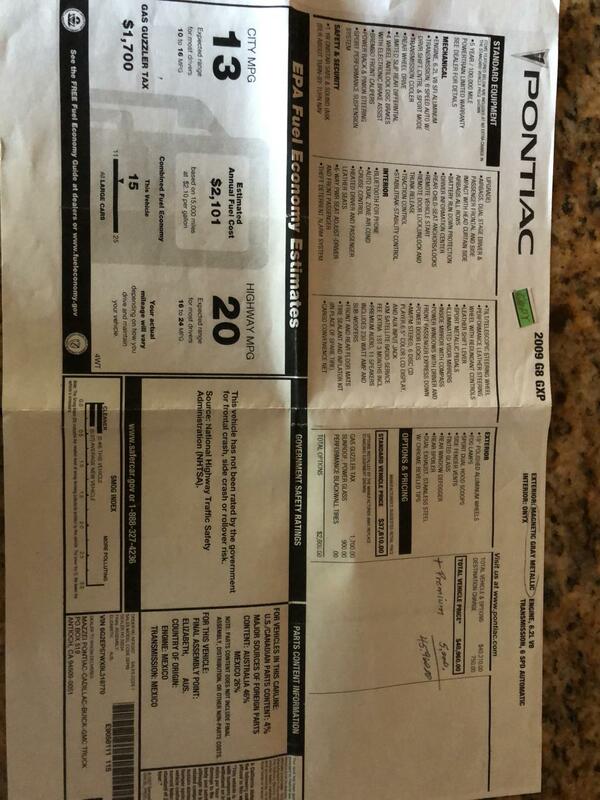 *TRANS COOLER*4 WHEEL ANTI-LOCK BRAKES*BREMBO FRONT CALIBERS*SPORT SUSPENSION*TRACTION CONTROL*STABILITY CONTROL*REMOTE START*AIR CONDITIONING*CRUISE CONTROL*HEATED SEATS*POWER SEAT*LEATHER SEATS*TILT TELESCOPIC WHEEL*POWER WINDOWS AND LOCKS*AM-FM STEREO/6CD PLAYER*19''ALUMINUM WHEELS*POWER SUNROOF*DUAL EXHAUST*BLUE TOOTH AND PHONE. 983 WERE AUTOMATICS, AND 846 WERE STANDARD SHIFT. THERE WERE ONLY 45 PRODUCED IN THIS GRAY COMBINATION . THESE GXP;S ARE THE HOLDING THERE VALUE AND ARE A GREAT LONG TERM INVESTMENT. 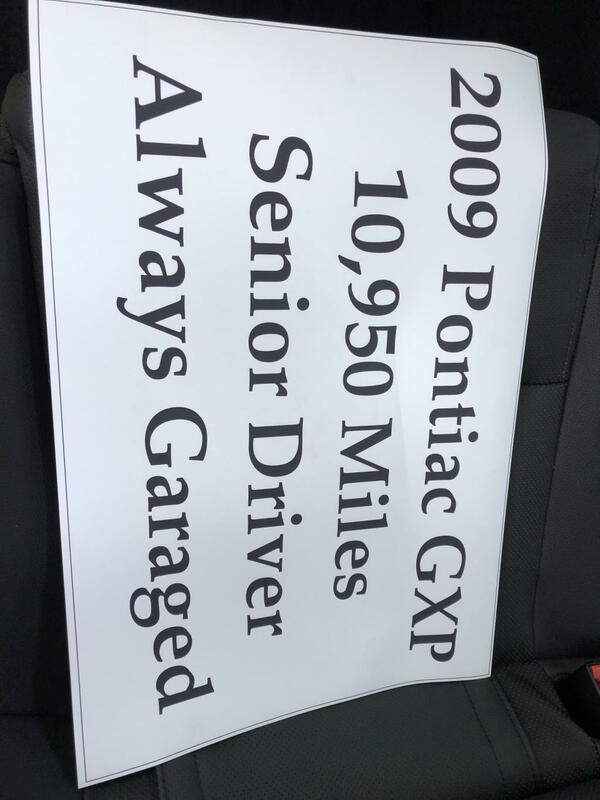 THIS ONE OWNER 2009 PONTIAC WAS BOUGHT NEW ON 11/24/09 IN NEW YORK .OWNER MOVES TO OCALA FLORIDA WERE CAR LIVES MOST OF ITS LIFE. THE CAR WAS ALWAYS GARAGED BY IT;S SENIOR OWNER. 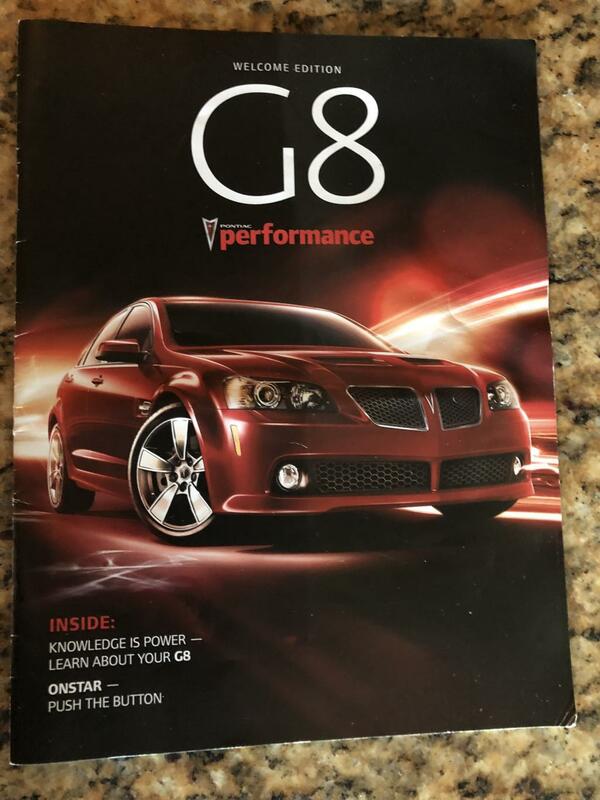 IF YOU HAVE NOT EXPERIENCED DRIVING A GXP WITH ITS HIGH PERFORMANCE 6.2 LITRE ALUMINUM V8 AND SUPERIOR HANDLING YOU ARE MISSING OUT ON ONE OF THE BEST CARS EVER BUILT. THIS GXP IS A RARE FIND , ONLY 45 BUILT LIKE THIS IN THE WORLD AND IS THE SECOND LOWEST MILEAGE ONE FOR SALE IN THE USA.